Woot!! 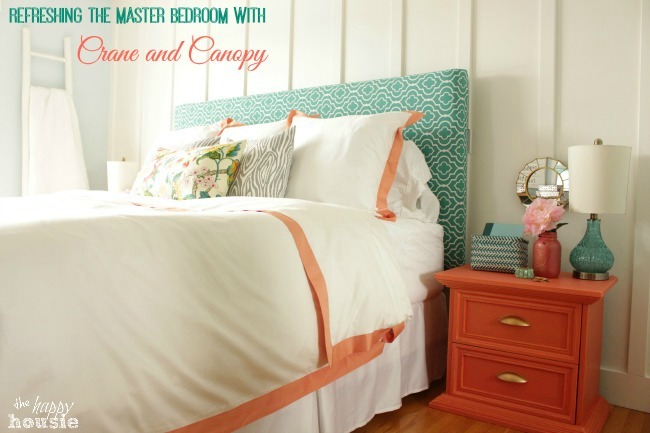 I am super pumped today to share the progress we have made on our Master Bedroom and how we have totally refreshed it with our beautiful new Linden Coral bedding from Crane and Canopy. I feel like it is a whole new room and am absolutely loving it…I keep pretending that I am staying in a beautiful hotel. And that I can sleep in and order room service in the morning. And not be woken up by a little face inches away from my own breathing heavily on me at 6:14 am. 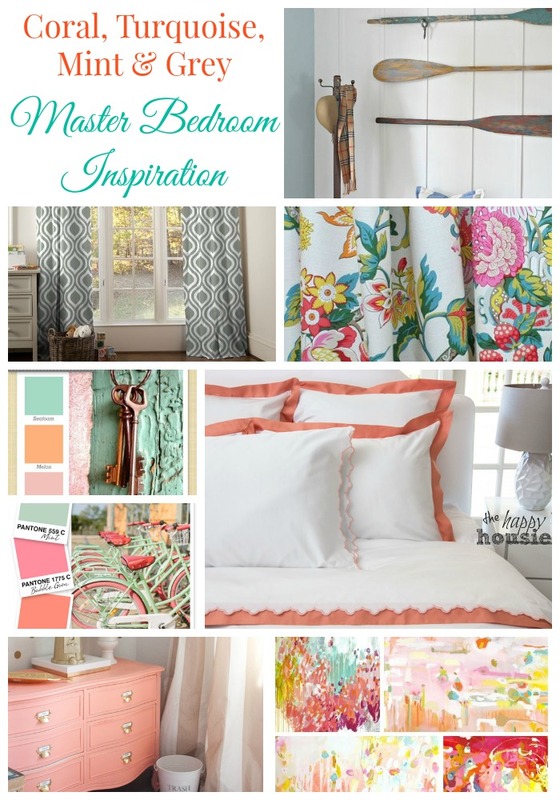 Do you remember when I shared my inspiration for refreshing our Master Bedroom a few weeks back? Last week I shared our tutorial for creating a feature wall behind the bed with Floor to Ceiling Board and Batten. We also reupholstered the headboard and switched to a plain white bed skirt. We recently received our beautiful new bedding from Crane and Canopy – the pattern is called Linden Coral. It truly has such a rich quality feel and look to it. The Linden Coral is made in a luxurious 400 thread count, XL staple cotton, which likely explains why I feel like I am sleeping in a luxury hotel! But the prices are so reasonable- you pay less then you would for a quality bedding set at a department store. 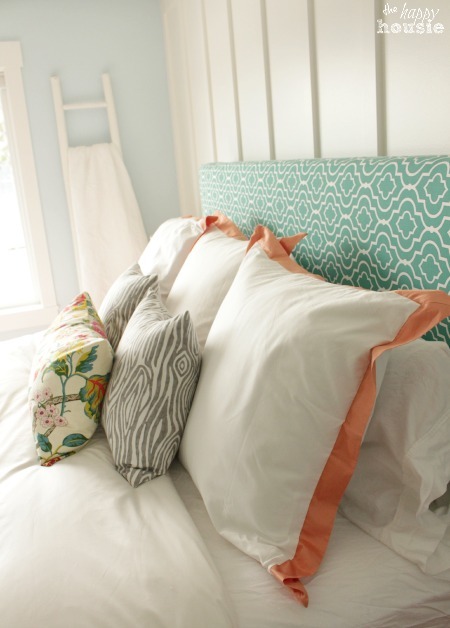 I went with three Euro size shams instead of two regular shams because I really thought that the strong coral border of the Linden Coral would look stunning in a row of Euro shams… only 8 pillows on our bed (that’s not too many, is it??). Isn’t it so pretty? I am absolutely thrilled with my choice of the Linden Coral, but if coral isn’t your thing then Crane and Canopy has many other bedding collections to choose from. I originally had a hard time deciding on one because I loved quite of few of the beautiful designer bedding styles they have available. Then Pin It to remember it!! Yup. Pretty thrilled with the whole thing. What do you think? Are you planning any changes to your Master Bedroom? Have you tried ordering bedding through Crane and Canopy before? What did you choose? Disclosure: Crane and Canopy provided me with the bedding but all opinions and commentary are 100% my own. Of course. « A Week of Inspiring Summer House Tours!! Wow ! What an amazing idea. Nobody can ignore to love it. Congrats! I picked your stunning master bedroom reveal as a feature at our Link it or Lump it party. Please stop by and grab a feature button. I love the colors! Thanks for sharing. Absolutely stunning! I love how fresh and bright your bedroom is. 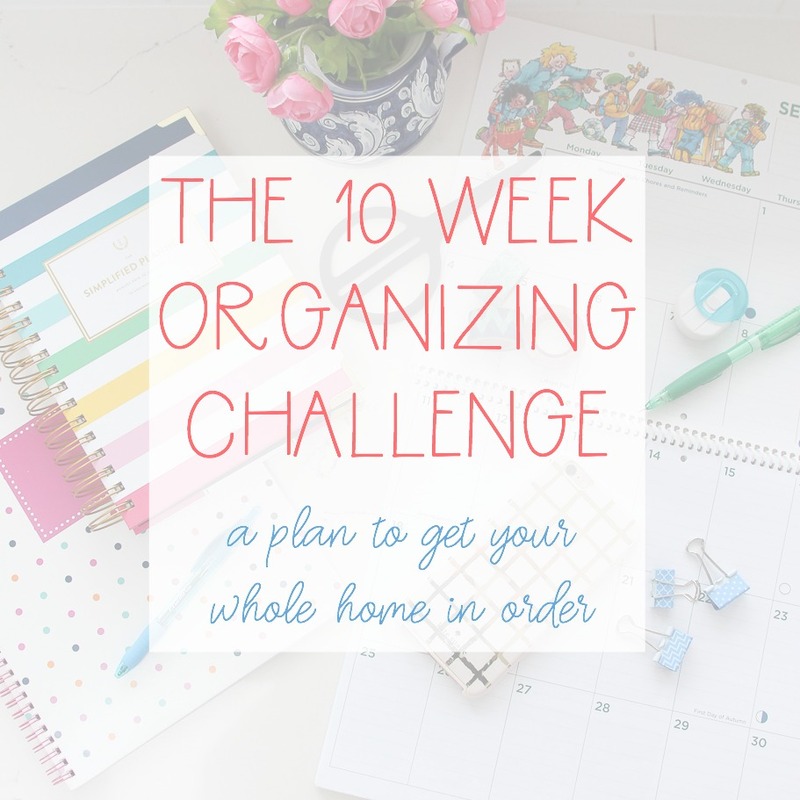 Thanks for linking up to our Motivational Monday party! 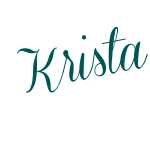 I love every part of it Krista! Wow, you are sleeping in a hotel, but prettier! Ha ha! This is great motivation for me to kick start my bedroom it needs SERIOUS help, well not the closet, but the rest! Pinned!!! 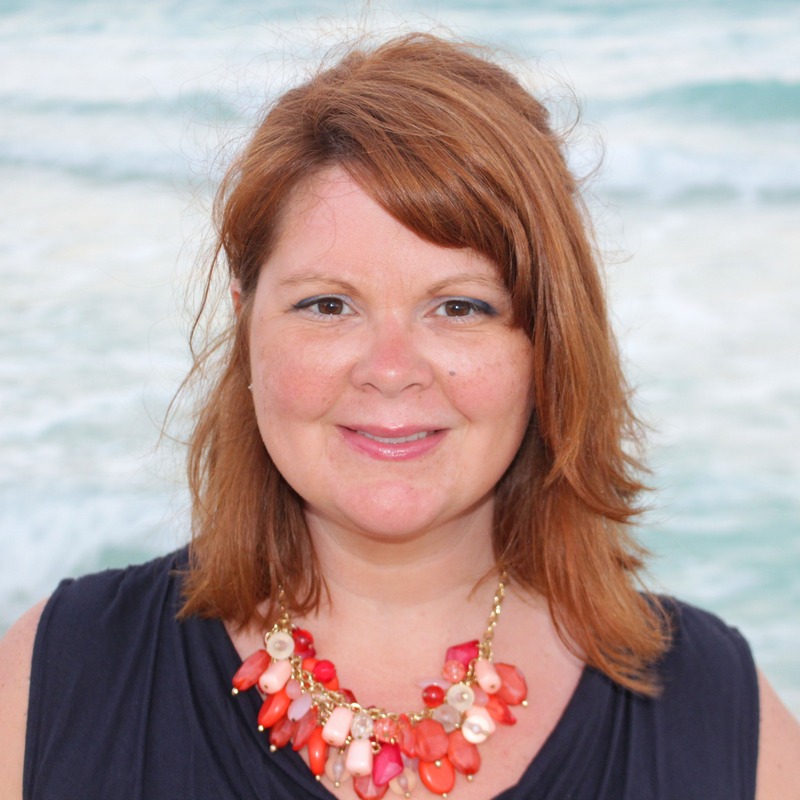 Krista, I love everything you do, and your bedroom is absolutely beautiful! Krista: I just got back from Alt and finally had a moment to look at your STUNNING bedroom! It turned out so lovely, but I had no doubts it would be anything else. And 8 pillows is not too many because hello those gray tree bark pillows are to die for! I am obsessed with your bedroom. That bedding is killer!! GORGEOUS!! I love Crane and Canopy! I love this color combo! 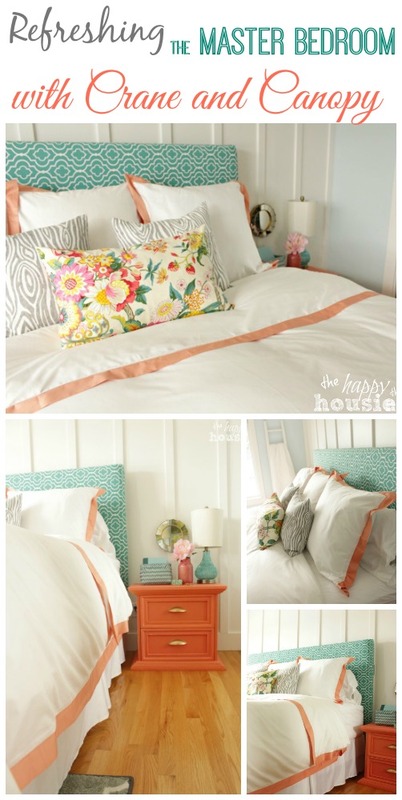 That bedding is perfect with the coral trim – so so pretty! Stunning, Krista! I love the bedding with your new headboard! Great color combo! Thanks so much for sharing! beautiful, beautiful colors. I’m in love! SOOOO pretty! I love your use of colours and patterns! 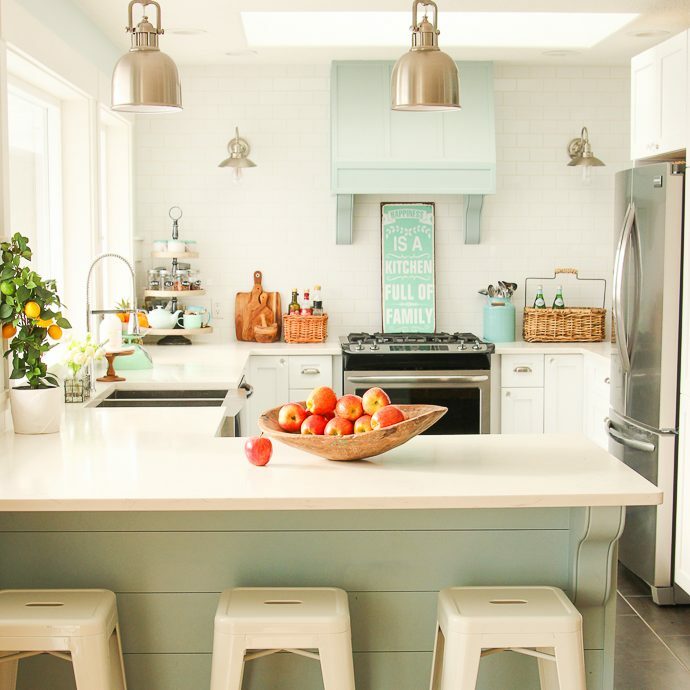 Nothing is too overwhelming and works great in the space… and that coral colour: LOVE! Wow! I love the colors! It is so bright & beautiful. I’m starting my master bedroom makeover and I’m going the exact opposite..You are bright & airy & I’m going dark & cozy (hopefully). But you have me questioning my choice right now! Oh Krista this is gorgeous! 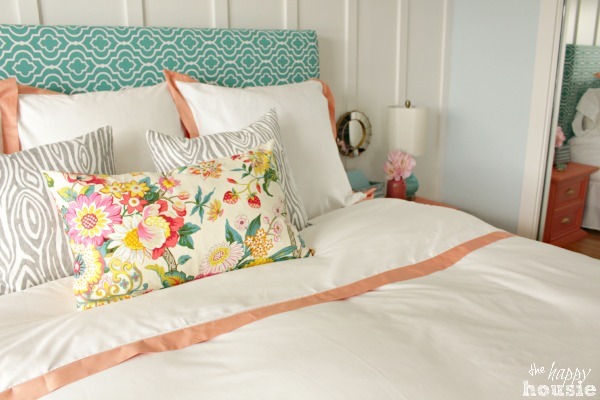 I love everything about it – the coral accents, the bedding, the floral pillow…SO beautiful! Um hello… are you accepting sleep over requests? Your room looks so relaxing, the perfect place for some naps 🙂 I love the coral you added! Looks absolutely beautiful! The color combination and the mix of patterns is perfect, great job! This is so so pretty. I love coral and it looks fantastic in this room! I’m going to have to check out Crane & Canopy. Krista, your bedroom is absolutely gorgeous! Like a breath of fresh air!! I love how happy it looks with those pops of coral and turquoise! Pinned! Wow, it looks so gorgeous! 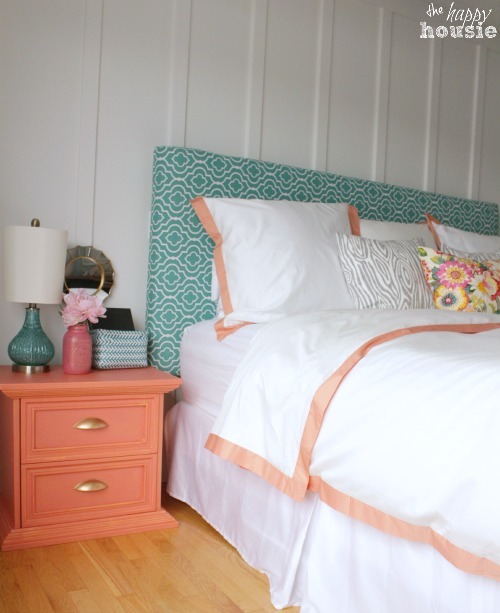 I love the colour scheme you chose, your board & batten wall, and that bedding is beautiful! What a gorgeous colour pallette its so light and bright and pretty! I love the turquoise and coral, it is so pretty. Such a lovely room. 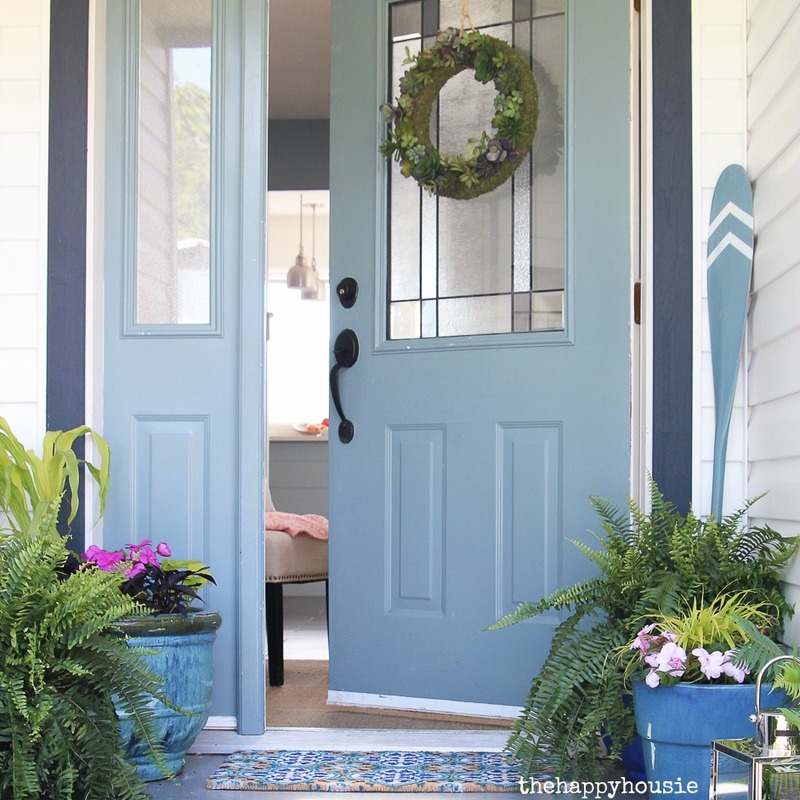 The board and batten is fabulous. it looks so fresh and inviting. Thanks tons for linking to Inspire Me. LOVE! Absolutely like every little detail. Great colors. Wow! This is so pretty 🙂 I especially love the floral pillow and woodgrain pillows – are they from Crane and Canopy as well? Such a beautiful room, and I love the DIYs, too! luv it! the coral color is stunning! Can’t wait to hear what paint you used! 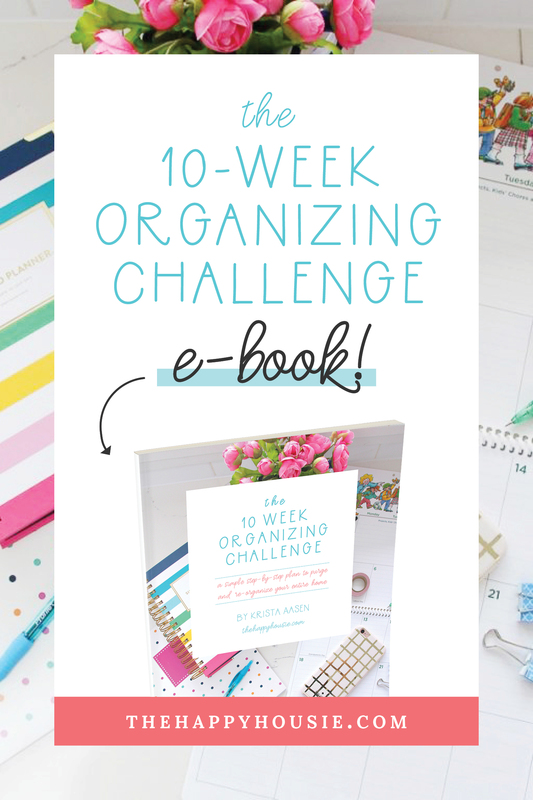 Wow, it’s AH-MAY-ZING! That looks so fresh & relaxing! I’ve always said I want my master bedroom to be like waking up in a fancy hotel! Love the colors and it’s so beautiful! We are re-working our Master and I’m using inspiration from our honeymoon in Jamaica and our resort there – lots of greens and brown… and I’m loving it! Love how fresh and pretty it looks. That bedding is gorgeous! love love love it! 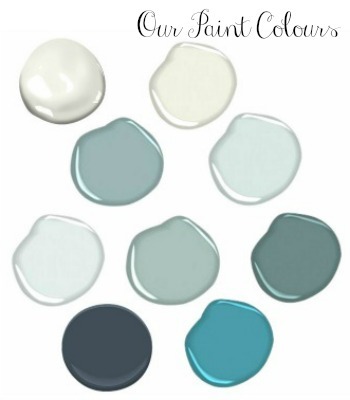 i have the blue in my bedroom- and you know they just came out with black! i might love that, too! 🙂 i love the clean lines of this set! gorgeous room! So pretty – just the right amount of colour mixed in with the white. Your style is fresh and beautiful. Love this room! !